(0 Customer Reviews) | Write Review 6 issues per year Young Rider entertains horse-crazy ‘tweens and teens with a fun-filled mixture of riding tips, horse-care hints, celebrity features, pen-pal pages, contests and two or more beautiful color posters. Aimed at horse-owning ‘tweens, teens, and horse-less lesson barn kids, Young Rider’s goal is to teach young people how to look after their horses properly and how to improve their riding skills safely. 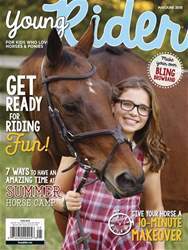 The only glossy, full-color equestrian magazine for young people in the United States, Young Rider is read by thousands of horse-loving children and their parents. Young Rider is a bimonthly magazine available on newsstands, by subscription and as a digital edition. Connect online with Young Rider at www.youngrider.com. Young Rider entertains horse-crazy ‘tweens and teens with a fun-filled mixture of riding tips, horse-care hints, celebrity features, pen-pal pages, contests and two or more beautiful color posters. You'll receive 6 issues during a 1 year Young Rider magazine subscription. You'll receive 6 issues during a 1 year Young Rider magazine print subscription.